Amada Rosa Pérez was one of Colombia’s top models before she disappeared years ago. She made headlines by sharing her conversion story. The Colombian newspaper “El Tiempo,” interviewed her and she explained that she had been diagnosed with a disease that left her with only 60 percent of her hearing in her left ear. The news caused her to question her lifestyle. “I felt disappointed, unsatisfied, directionless, submerged in fleeting pleasures ...” she said. “I always sought answers and the world never gave them to me.” “Before I was always in a hurry, stressed out, and got upset easily," she continued. "Now I live in peace, the world doesn’t appeal to me, I enjoy every moment the Lord gives me. 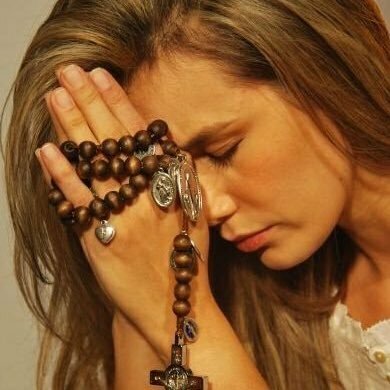 I go to Mass, I pray the Holy Rosary daily, as well as the Divine Mercy Chaplet at 3 p.m. “I go to confession frequently,” she said. Amada works with a Marian religious community in Colombia. “Being a model means being a benchmark, someone whose beliefs are worthy of being imitated, and I grew tired of being a model of superficiality. I grew tired of a world of lies, appearances, falsity, hypocrisy and deception, a society full of anti-values that exalts violence, adultery, drugs, alcohol, fighting, and a world that exalts riches, pleasure, sexual immorality and fraud. “I want to be a model that promotes the true dignity of women and not their being used for commercial purposes,” Amada said.